﻿ Zahrat Al Jabal Fes. JIMAT di Agoda.com! Menawarkan penginapan yang berkualiti tinggi di daerah budaya, siar-siar di Fes, Zahrat Al Jabal merupakan pilihan popular untuk kedua-dua tujuan perniagaan dan percutian. Dari sini, tetamu boleh menikmati akses mudah kepada semua yang bandar meriah ini boleh tawarkan. Pelawat yang datang ke hotel boleh melawat tarikan utama di bandar ini seperti: Taman Awam, Galeri Seni Orientalist, Ibn Danan Synagogue. Menawarkan tetamu hotel perkhidmatan yang unggul dan pelbagai kemudahan, Zahrat Al Jabal komited untuk memastikan penginapan anda berada di tahap seberapa selesa yang mungkin. Kemudahan utama hotel termasuklah Wi-Fi percuma dalam semua bilik, meja penyambut tetamu 24-jam, daftar masuk/daftar keluar ekspres, simpanan bagasi, parkir valet. Alami bilik dengan kemudahan berkualiti tinggi sepanjang anda menginap di sini. Sebahagian bilik menyediakan pendingin hawa, pemanas, panggilan kejut, bar mini, beranda/teres untuk memudahkan tetamu berehat dan kembali bertenaga. Hotel ini menyediakan kemudahan rekreasi yang baik seperti taman untuk membuat penginapan anda benar-benar tidak dapat dilupakan. Apa juga tujuan lawatan, Zahrat Al Jabal merupakan pilihan yang terbaik bagi penginapan anda di Fes. MAD 320 will be collected upon check-in as additional taxes and fee. No one at this hotel speaks much English; even the front desk staff were very difficult to understand. The hotel overcharged us in US$ per the agreed-upon reservation with Agoda.com. They would also not let us charge our bill to our credit card which made us late for our bus the next city as they forced us to go to a bank and then pay them in their local currency. I would not recommend this hotel to anyone - it made our stay in Fez negative even though we got to see many great things. The hotel was not helpful in any planning of our visit to see the city - they could not read a map nor make any recommendations in any version of English - a very unfortunate stay. I would never stay their again. They serve a good breakfast. 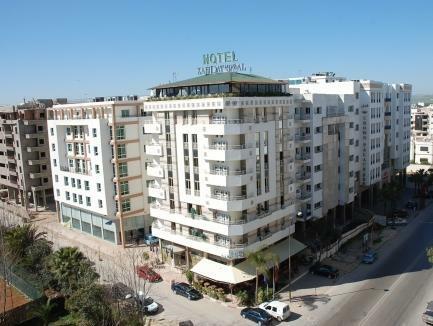 the hotel is in a good enough location, just abt 100m from the av hassan ii. it is also not too far from the the train station. the staff were friendly enough and helpful. room was not spacious but clean. same with the bathroom/toilet. however we enjoyed the breakfast. local food was served as well. even we arrived before noon we could quickly check-in, the room was clean and had nice park view vith a big balcony. the breakfast had local taste, so we really enjoyed it. the service was very helpful finding us a taxi to the airport. there is no vent in the bathroom, smell a lot if you leave bathroom door open. Nice hotel but no vent in the bathroom, very small to take shower, Breakfast is just O K. Wifi can be only available only in the loby which is very small with very bad connection, often loose the streight of connection. But surely rooms are clean. the people that were supposed to work in the breakfast don't work, they don't even take off a plate that is dirty in front of you, the blond woman in the reception!!!! Everything was great! the room, the staff of the reception and laundry, We sent some clothes to wash and it was ready so fast, and very smelly. I rightly recommend this hotel for budget travelers. Only the receptionist (Madam Huda) speaks English. The rest of the staff especially in the Terrace Restaurant, although friendly, can only communicate either in French or Arabic, hence, the language barrier. We booked a triple and got a rather small but lovely room, especially the toilet and bathroom. The hotel is relatively new. The interior decor of the rooms, lobby, and restaurant is beautiful. Upon our arrival we ordered pizza at the rooftop restaurant and got satisfied. The restaurant staff were all warm and friendly, although they are not able to communicate in English. Good thing some of them speak a little Arabic just like us. The buffet breakfast can be improved to include more interesting items. The food they served were rather cold, even the bread. Wifi is available in the rooftop restaurant and lobby but not in the rooms. Perhaps they can do something about this so that the guests can enjoy the internet connection in the privacy of their bedrooms. Overall, we find this hotel a good choice during our stay in Fes and we will not hesitate to stay here on our future trips to this imperial city. Initially they gave me the room on the 2nd floor which was alright as the air conditioning was working just fine. The next day I requested an upper floor (6th) which was a big mistake as it seems to me that air conditioning was not working on the upper floors. For the price, this is a basic hotel to crash after a long day. The room and bath may feel claustrophobic at times, not conducive to long showers. Other bathrooms have tiny bath tubs, half the size of standard ones. Breakfast at the 6th floor would be better if they had fried instead of boiled eggs. Orange juice is Tang, not fresh. The hotel web site gave me a price higher than Agoda. They accepted Agoda voucher easily. 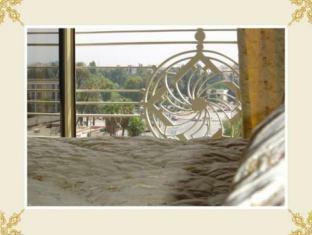 Located right at the new city centre, close to like Moroccan people say Fez's Champs-Elysees. Many restaurants around and a good starting point for exploring the medina in taking a small taxi. The breakfast was a bit basic, but it was good and served in reastuarnt on the roof with amazing view on the city. It's generally a positive quality / price / location. Aufenthalt war angenehm, kleines Zimmer aber alles sauber, die Mitarbeiter immer sehr freundlich und hilfsbereit. Nur das Frühstück war etwas erweiterungsbedürftig. Ansonsten durchaus für ein verlängertes Wochenende empfehlenswert. Die Lage ist super gut, gute Anbindung und saubere Umgebung. L'aspetto che più abbiamo apprezzato nell'hotel, sono stati: la praticità e la comodità. In particolare la localizzazione, situato nella città nuova, in posizione comoda a tutti i servizi ed alla stazione, ma, allo stasso tempo, non troppo lontano dalla Medina. La stanza era un po' piccola, ma dotata di una finestra luminosa e con un bell'affaccio (non so se sono così tutte le stanze dell'albergo....). Bella la sala all'ultimo piano usata per le colazioni e come ristorante (molto buono). L'albergo è pulito ed ha un buon rapporto qualità prezzo. le camere sono piccole ma accoglienti, buona climatizzazione e pulizia, il personale è gentile e disponibile ma pochi conoscono l'inglese. Se prenotate il taxi in hotel costa molto di più che fuori, quasi il doppio e questo non è carino, Il ristorante offre sia cucina internazionale sia tipica del Marocco. La prima colazione non è eccezionale ma sufficiente. La posizione è comoda sia per andare alla medina sia per visitare la parte nuova della città.